This page provides basic description of marker labels and instructions on labeling workflow in Motive. Labeled markers of a rigid body asset in Motive. Marker labels are basically software name tags that are assigned to trajectories of reconstructed markers so that they can be referenced for tracking individual markers, rigid bodies, or skeletons. Motive identifies marker trajectories using the assigned labels. 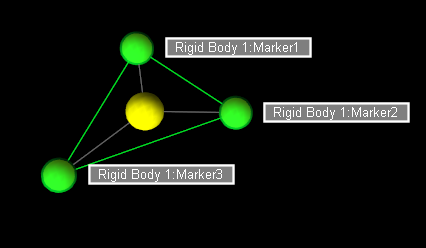 Labeled trajectories can be exported individually, or combined together to compute positions and orientations of the tracked objects. In most applications, all of the target 3D markers will need to be labeled in Motive. There are two methods for labeling markers in Motive: auto-labeling and manual labeling, and both labeling methods will be covered in this page. 3D Perspective Viewport: From the 3D viewport, check the Marker Labels in the visual aids option to view marker labels for selected markers. Labeling pane: The labeling pane lists out all of the marker labels and corresponding percentage completeness for each label. The color of the label also indicates whether if the label is present or missing at the current frame. Graph View pane: For frames where the selected label is not assigned to any markers, the timeline scrubber gets highlighted in red. Also, the tracks view of this pane provides a list of labels and their continuity in a captured Take. 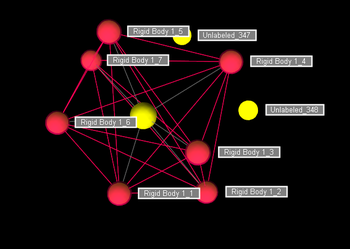 Using the Graph View pane to view unlabeled trajectory gaps on labeled marker. Using the Labeling pane to correct the unlabeled marker trajectories. Auto-label: Automatically label sets of rigid body markers and skeleton markers using calibrated asset definitions. 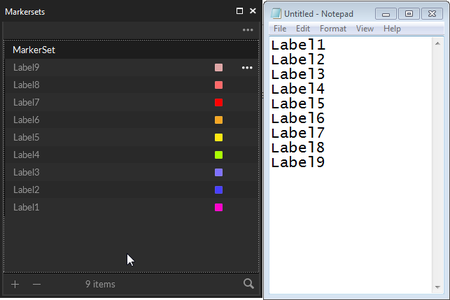 Manual Label: Manually label individual markers using the Labeling pane. For tracking rigid bodies and skeletons, Motive can use the asset deinitions to automatically label associated markers both in real-time and post-processing. 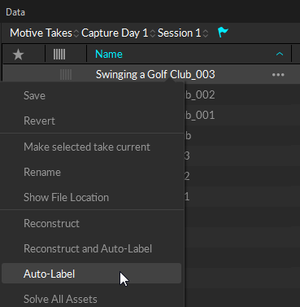 The auto-labeler uses active assets, or assets that are checked in the Assets pane, to search for a set of markers that agrees with the calibrated definition and assign pre-defined labels throughout the capture. Active assets are checked on the Assets pane. Performing Auto-labeling pipeline on a selected Take the Data Management pane. There are times, however, when it is necessary to manually label a section or all of a trajectory, either because the markers of a rigid body or a skeleton were misidentified (or unidentified) during capture or because individual markers need to be manually labeled. In these cases, the Labeling pane in Motive is used to perform manual labeling of individual trajectories. Manual labeling workflow is supported only in post-processing of capture when a Take file (TAK) has been loaded with 3D data as its playback type. In case of 2D data only capture, the Take must be Reconstructed first in order to assign, or edit, the marker labels in its 3D data. This manual labeling process, along with 3D data editing is typically referred to as post processing of mocap data. Rigid body and skeleton asset definitions contain information of marker placements on corresponding assets. This is recorded when the assets are first created, and the auto-labeler in Motive uses them to label a set of reconstructed 3D trajectories that resemble marker arrangements of active assets. Once all of the markers on active assets are successfully labeled, corresponding rigid bodies and skeletons get tracked in the 3D viewport. The auto-labeler runs in real-time during Live mode and the marker labels get saved onto the recorded TAKs. Running the auto-labeler again in post-processing will basically attempt to label the rigid body and skeleton markers again from the recorded 3D data. Open a Take that you wish to auto-label. Use the Auto-label button ( ) to run the auto-label pipeline. Labeling Tutorial 2. Manual Labeling in Motive. This video is based on older version of Motive. There maybe a few differences in Motive 2.0, but the general workflow still remains the same. The Labeling pane is used to assign, remove, and edit marker labels in the 3D data. The Tracks View under the Graph View pane can be used in conjunction with the Labeling pane to monitor which markers and gaps are associated. The Labeling pane is also used to examine the number of occluded gaps in each label, and it can be used along with the Editing Tools for complete post-processing. 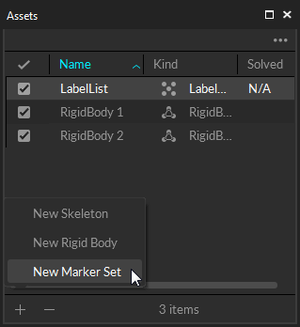 Using the Labeling pane, you can assign marker labels for each asset (MarkerSet, Rigid Body, and Skeleton) via the QuickLabel Mode . The Labeling Pane also shows a list of labels involved in the Take and their corresponding percent completeness values. The percent completeness values indicate frame percentages of a Take for which the trajectory has been labeled. If the trajectory has no gaps (100% complete), no number will be shown. You can use this pane together with the Graph View pane to quickly locate gaps in a trajectory. For a given frame, all labels are color-coded. For each frame of 3D data, assigned marker labels are shown in white, labels without reconstructions are shown in red, and unlabeled reconstructions are shown in orange; similar to how they are presented in the 3D View. See the Labeling Pane page for detailed explanation on each option. The QuickLabel mode allows you to tag labels with single-clicks in the view pane, and it is a handy way to reassign or modify marker labels throughout the capture. When the QuickLabel mode is toggled, the mouse cursor switches to a finger icon with the selected label name attached next to it. Also, when the display label option is enabled in the perspective view, all of assigned marker labels will be displayed next to each marker in the 3D viewport, as shown in the image below. Select the marker set you wish to label, and tag the appropriate labels to each marker throughout the capture. When assigning labels using the Quick Label Mode, the labeling scope is configured from the labeling range settings. You can restrict the labeling operation to apply from the current frame backward, current frame forward, or both depending on the trajectory. You may also restrict labeling operations to apply the selected label to all frames in the Take, to a selected frame range, or to a trajectory 'fragment' enclosed by gaps or spikes. The fragment/spike setting is used by default and this best identifies mislabeled frame ranges and assigns marker labels. See the Labeling pane page for details on each feature. Re-labeling skeleton markers using the QuickLabel Mode. Under the drop-down menu in the Labeling pane, select an asset you wish to label. All of the involved markers will be displayed under the columns. From the label list, select unlabeled or mislabeled markers. Inspect the behavior of the selected trajectory and decide whether you want to apply the selected label for frames before the current frame or frames after the current frame by toggling each icon. If you wish to assign selected label to a trajectory of entire capture, enable both of them. Switch to QuickLabeling Mode (Hotkey: D). In the Perspective View pane. Assign the selected label to a marker reconstruction. If the Increment Selection is enabled, label selection in the Labeling pane will automatically advance each time you assign them. After assigning all labels, switch back to normal Select Mode . The following section provides the general labeling steps in Motive. Note that the labeling workflow is flexible and alternative approaches to the steps listed in this section could also be used. 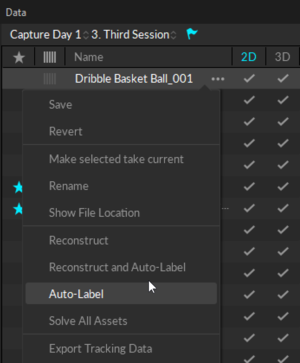 Utilize the auto-labeling pipelines in combination with the Labeling pane to best reconstruct and label the 3D data of your capture. When using the Labeling pane, choose the most appropriate labeling setting (all, selected, spike, or fragment) to efficiently label selected trajectories. See more from the Labeling pane page. Hotkeys can increase the speed of the workflow. 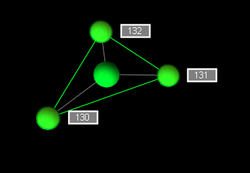 Use Z and Shift+Z hotkeys to quickly find gaps in the selected trajectory. When working with skeleton assets, label the hip segment first. The hip segment is the main parent segment, top of the segments hierarchy, where all other child segments are associated to. Manually assigning hip markers sometimes help the auto-labeler to label the entire asset. Show/Hide skeleton visibility in the perspective view to have a better view on the markers when assigning marker labels. 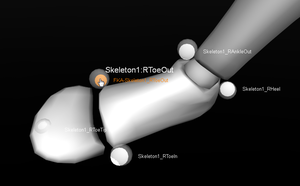 Toggle skeleton selectability in the perspective view to use the skeleton as a visual aid without it getting in the way of marker data. Show/Hide skeleton sticks and marker colors under the visual aids in the perspective view options for intuitive identification of labeled markers as you tag through skeleton markers. 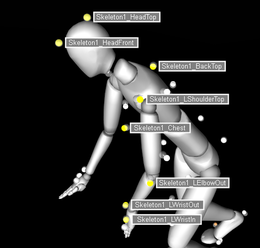 For skeleton assets, the Show Tracking Errors property can be utilized to display tracking errors on skeleton segments. Step 1. In the Data Management pane, Reconstruct and auto-label the take with all of the desired assets enabled. Step 2. In the Graph View pane, examine the trajectories and navigate to the frame where labeling errors are frequent. Step 3. Open the Labeling pane. Step 4. Select an asset that you wish to label. Step 5. From the label columns, Click on a marker label that you wish to re-assign. Step 6. Inspect behavior of a selected trajectory and its labeling errors and set the appropriate labeling settings (allowable gap size, maximum spike and applied frame ranges). Step 7. Switch to the QuickLabel mode (Hotkey: D). Step 8. On the Perspective View, assign the labels onto the corresponding marker reconstructions by clicking on them. Step 9. When all markers have been labeled, switch back to the Select Mode. Step 1. Start with 2D data of a captured Take with model assets (skeletons and rigid bodies). Step 2. 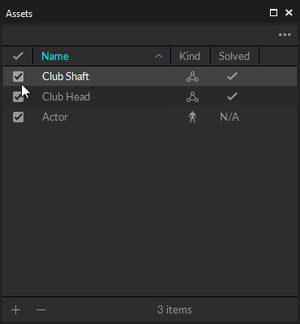 Reconstruct and Auto-Label, or just Reconstruct, the Take with all of the desired assets enabled under the Assets pane. If you use reconstruct only, you can skip step 3 and 5 for the first iteration. Step 3. Examine the reconstructed 3D data, and inspect the frame range where markers are mislabeled. Step 4. Using the Labeling pane, manually fix/assign marker labels, paying attention to your label settings (direction, max gap, max spike, selected duration). Step 5. Unlabel all trajectories you want to re-auto-label. Step 6. Auto-Label the Take again. Only the unlabeled markers will get re-labeled, and all existing labels will be kept the same. Step 7. Re-examine the marker labels. If some of the labels are still not assigned correctly from any of the frames, repeat the steps 3-6 until complete. Identify the trajectory with the labeling error. Determine if the error is a swap, an occlusion, or unlabeled. Resolve the error with the correct tool. Swap: Use the Swap Fix tool ( Edit Tools ) or just re-assign each label ( Labeling Panel ). When manually labeling markers to fix swaps, set appropriate settings for the labeling direction, max spike, and selected range settings. Occlusion: Use the Gap Fill tool ( Edit Tools ). Unlabeled: Manually label an unlabeled trajectory with the correct label ( Labeling Panel ). For more data editing options, read through the Data Editing page. Following tutorials use Motive 1.10. On Motive 2.0., Data pane and Assets pane is used instead of the Project pane. When recorded 3D data have been labeled properly and entirely throughout the Take, you will not need to edit marker labels. If you don't have 3D data recorded, you can reconstruct and auto-label the Take to obtain 3D data and label all of the skeleton and rigid body markers. If all of the markers are well reconstructed and there are no significant occlusions, auto-labeled 3D data may be acceptable right away. In this case, you can proceed without post-processing of marker labels. Recorded 3D data has no gaps in the labels, or the Reconstruct and Auto-label works perfectly the first time without additional post-processing. Examine the Take(s). Check the Labeling pane, or the tracks view, to make sure no occlusion exists within the capture, and all markers are consistently labeled. When skeleton markers are mislabeled only within specific frame ranges of a Take, you will have to manually re-label the markers. This may occur when a subject performs dynamic movements or come into contact with another object during the recorded Take. After correcting the mislabeled markers, you can also use the auto-labeler to assign remaining missing labels. Start with recorded 3D data or Reconstruct and auto-label the Take to obtain newly labeled 3D data. Inspect the Take to pick out the frame ranges with bad tracking. If markers are mislabeled during majority of the capture, unlabel all markers from the entire capture by right-clicking on the Take in Data Management pane and click Delete Marker Labels. You can do this on selected frame ranges as well. 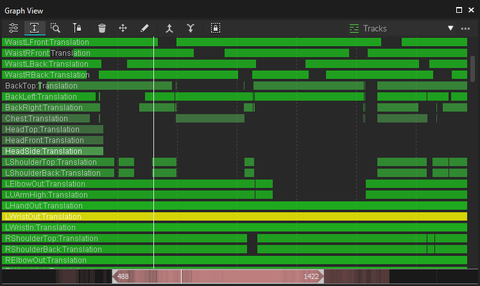 Scrub the timeline to a frame just before the bad tracking frame range. Using the Labeling pane, manually label the skeleton. Depending on the severity of the mislabels, you can either label the entire skeleton or just the key segments starting from the hip. Scrub the timeline to a frame after the bad tracking frame range. Manually label the same skeleton. Check the frames again and correct any remaining mislabels using the Labeling pane. For Take(s) where skeletons are never perfectly tracked and the markers are consistently mislabeled, you will need to manually assign the correct labels for the skeleton asset(s). Situations like this could happen when the skeleton(s) are never in an easily trackable pose throughout the Take (e.g. captures where the actors are rolling on the ground). It is usually recommended that all skeleton ‘’Takes’’’ start and end with T-pose in order to easily distinguish the skeleton markers. This also helps the skeleton solver to correctly auto-label the associated markers; however, in some cases, only specific section of a Take needs be trimmed out, or including the calibration poses might not be possible. Manually assigning labels can help the auto-labeler to correctly label markers and have skeletons acquire properly in a Take. You will get best results if you manually label the entire skeleton, but doing so can be time-consuming. You can also label only the mislabeled segment or the key segment (hip bone) and run the auto-labeler to see if it correctly assigns the labels with the small help. Start with recorded 3D data or Reconstruct the Take. At a certain point of the Take (usually at a frame where you can best identify the pose of the skeleton), use the Labeling pane to manually assign the marker labels for skeletons that are not labeling correctly. Depending on the severity of the mislabels, you can either label the entire skeleton or only the key segments starting from the hip. After manually assigning the labels, auto-label the Take. Make sure the corresponding assets are enabled in the Assets pane. Check to see if all markers are correctly assigned throughout the take. If not, re-label or unlabel, any mislabeled markers and run auto-label again if needed. Marker occlusions can be critical to the auto-labeling process. After having a gap for multiple frames, occluded markers can be unlabeled entirely, or nearby reconstructions can be mistakenly recognized as the occluded marker and result in labeling swaps or mislabels. Skeleton and rigid body asset definitions may accommodate labeling for such occlusions, but in some cases, labeling errors may persist throughout the Take. The following steps can be used to re-assign the labels in this case. If tracked markers are relatively stationary during the occluded frames, you may want to increase the Maximum Marker Label Gap value under the Auto-Labeler settings in the Reconstruction pane to allow the occluded marker to maintain its label after auto-labeling the Take. However, note that adjusting this setting will not be useful if the marker is moving dynamically beyond the Prediction Radius (mm) settings during occlusion. Examine through the Take, and go to a frame where markers are mislabeled right after an occlusion. In the Labeling pane, disable the Increment Label Selection option, and select a marker set and a label that is frequently occluded. In the Labeling pane, disable the Apply Labels to Previous Frames option, and leave only the Apply Labels to Upcoming Frames option enabled. Using the Quick Label Mode, correct the labeling errors. Move onto next occluded frames. When the marker reappears, correct the labels. After correcting the labels, Auto-label the Take again. Use the Fill Gaps tool in the Editing tools to interpolate the occluded trajectories. This page was last modified on 20 December 2018, at 19:59.